Oath of Honor is a page-turning suspense! Eason pulled me into the story from the very beginning and held my attention until the last word was read. The authenticity of the St. John family brings the story to life, as does the intense investigation that unfolds. I delighted in Izzy’s and Ryan’s subtle romance, and the suspense and surprises kept me eagerly turning page after page. 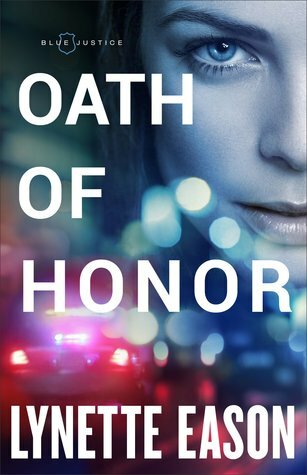 Oath of Honor begins an exciting new series, and it is one I can’t wait to continue! Police officer Isabelle St. John loves her crazy, loud, law-enforcement family. With three brothers and two sisters, she’s never without someone to hang out with–or fight with. And she knows they’ll be there for her when things get tough. Like when her partner is murdered and she barely escapes with her own life. Determined to discover exactly what happened, Izzy’s investigation sends her headfirst into a criminal organization, possibly with cops on the payroll–including someone from her own family. With her dead partner’s handsome homicide detective brother Ryan shadowing her every move, Izzy’s head is spinning. How can she secure justice for her partner when doing so could mean sending someone she loves to prison? And how will she guard her heart when the man she’s had a secret crush on for years won’t leave her side?